16-May-2017 -- After staying the night in Springfield, Missouri, I spent the next morning visiting this easy point - about 1 hour’s drive north. 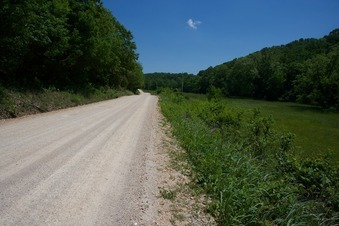 After passing through the small town of Macks Creek, I ended up on Coffey Hollow Road - a gravel country road that runs roughly east-west. Coincidentally, the point lies on the edge of this road. This is one of those points that seems to perfectly encapsulate the surrounding area. It lies in a rustic rural area, laced with quiet country roads. (During my visit, not a single other vehicle passed by.) There are few buildings nearby - only an old barn, just to the west.